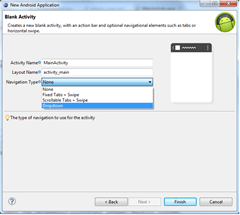 Android ActionBar supports different navigation types within activities. We saw in an older post that we can use Tabs to navigate or we can use Drop Down Navigation. In this post we will see how we can implement the drop down navigation using fragments. What is exactly the drop down navigation? It is essentially a list of items in the actionbar. This items represent action and when we select one of them we activate the corresponding action. Usually selecting one item we move to another UI that can be implemented using Fragments. // Set up the action bar to show a dropdown list. where at line 4 we enable our navigation type. Looking at the code generated we notice that it is a little bit different form the one we have above because instead of this, it uses getActionBarThemedContextCompat. Looking at this method code we find out that it returns this for all the version below Ice Cream Sandwich and another value otherwise. This is used to maintain the compatibility with the all android version. Notice that we used this as method parameter. This means that our activity has to implement an interface so that it gets notified when user picks an item. Now in this method we have to activate the right view according to the item selected by user. Usually we can use Fragment to enable the right UI. In this method we can instantiate a new fragment and replace the existing one with the new one. How to edit location of navigation ? For example, end of row ?